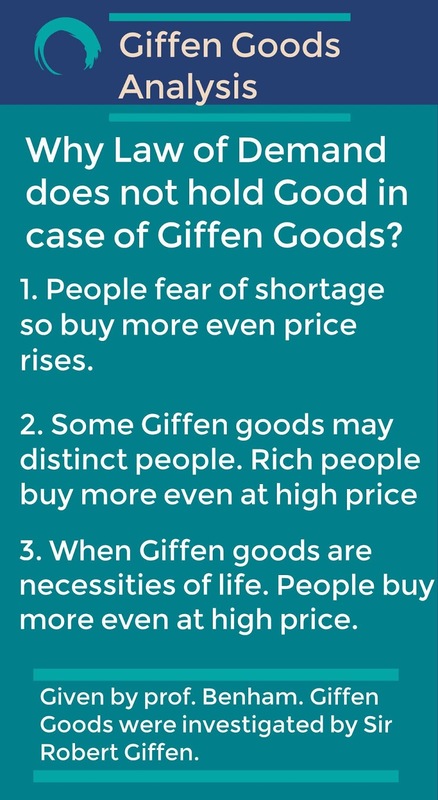 Giffen Goods are named on Sir Robert Giffen. These goods are first investigated by him in a factory when he was observing some workers. They found that even on rising prices on bread, demand increased. 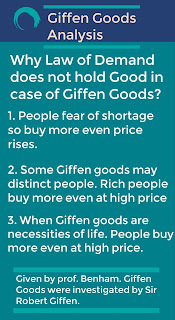 In case of Giffen Goods, demand is strengthened with a rise or weakened with a fall in price. In other words demand curve slopes upward instead of downward. Now question is that which are these goods purchased more even at rising price. Apply this situation on yourself and think that which goods you will purchase more even at high price and also find why? Let me help you to find the situations when this situation applies. Actually our economists already had found the cases when these goods are bought more even at high price. 1.When people think that there is a shortage of commodity in future they get panicked and buy more even at high price. 2. If a commodity distinct the people then wealthy people will start to buy more when the price will rise. Conversely when people think and believe that commodity is inferior they cut their purchase even at low price. 3. People buy more at a high price in sheer ignorance. 4. In case of a commodity which is necessary for life, if price goes up then customer has to adjust. He cuts his other expenditures on other goods for buying more of that particular good. So he buy more even at high price.